Camp Kennedy aims to empower 25 young Romanians aged 15-17 to become active citizens, increase their English language ability, learn more about U.S. democratic values, and offer participants the necessary life-long tools to engage in civic activism and social responsibility. Through this unique program, Romanian teens will get the chance to understand the tools of civic activism first-hand, while augmenting their English language skills needed for our globalized world. 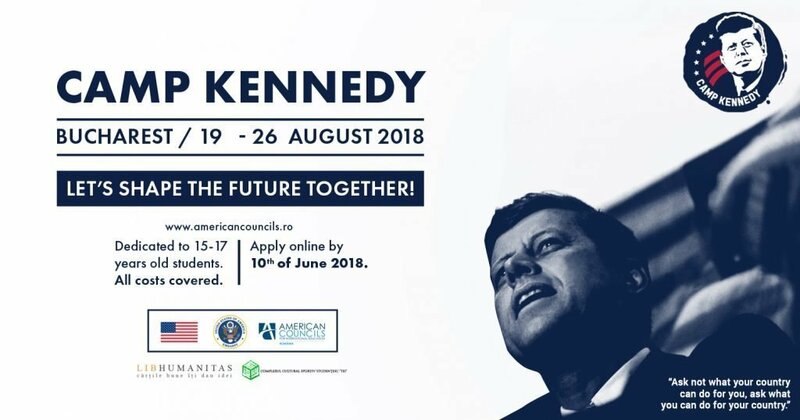 Inspired by President Kennedy’s inaugural address asking Americans to reflect upon what they could do for their country, this camp will draw on the best civic engagement practices from the United States designed to support Romanian citizens who are committed to making substantive contributions to their own country. All camp activities will advance leadership and other 21st Century skills development by cultivating critical thinking, public speaking, teambuilding, and goal setting. Teaching methods will include interactive workshops and simulations, peer discussions, observations and critical reflections of government institutions, and interactions with decision-makers, including Members of Parliament, Government, and their staff, as well as study visits to relevant organizations and institutions. A program sponsored by the U.S. Embassy in Romania and coordinated by American Councils for International Education-Romania with the logistical support of CCSS Tei.